« [Recipe] Nutella & Fig Jam Pie Pops – Happy Pi Day! Mr. and I were planning a dinner with his friends one weekend, and we’re all craving Asian food. In Richmond. Endless options, I know. 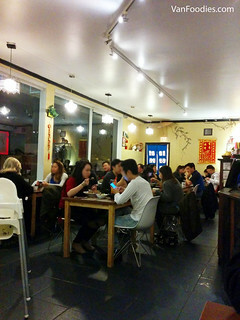 We narrowed it down to Taiwanese, and came to Memory Corner just steps away from Richmond Centre. Between the two of us, we shared a few things. 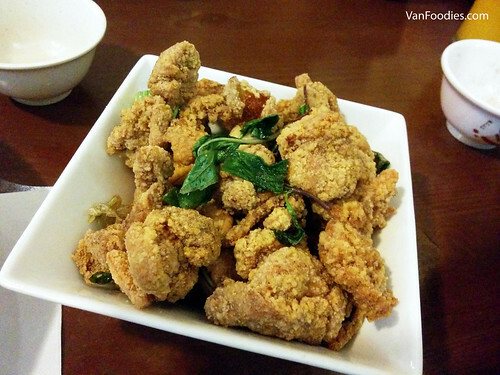 First, the Taiwanese Deep Fried Crispy Chicken 鹽酥雞 is like a staple item for us whenever we go for Taiwanese food. This was a generous portion! It was crispy outside, and the meat was tender, moist inside. The breading was quite thin so it wasn’t all breading that we were eating. The Thai basil on top was not just a garnish; because it’s slightly fried, it actually added some aroma and subtle flavours to the chicken nuggets as well. LH told us that the Satay Lamb series at Memory Corner is really good. According to its website and signage at the restaurant, this is a 3rd-generation of a family restaurant that specializes in lamb cuisine. We had to order one of those dishes. 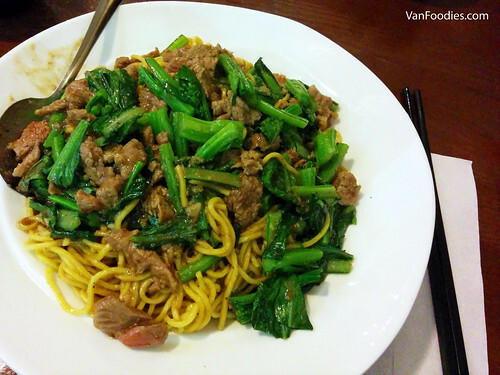 The Satay Lamb with Fried Noodles 沙茶羊肉炒麵 was very good! There’s nothing fancy in the plating; it just looks very homey. Looks like a lunch or dinner that your mom cooks for you. The lamb wasn’t the hotpot style, thinly sliced frozen kind. It looked like fresh lamb meat that was sliced to just the right bite size. They were tender, some still slightly pink. The satay sauce is a common marinate/seasoning in Taiwanese cuisine and it could get salty if used too much. This was seasoned just right. The noodles perhaps were a bit too mushy for my liking but I like that there’s also a lot of veggies in the dish – there’s no shortage of toppings! 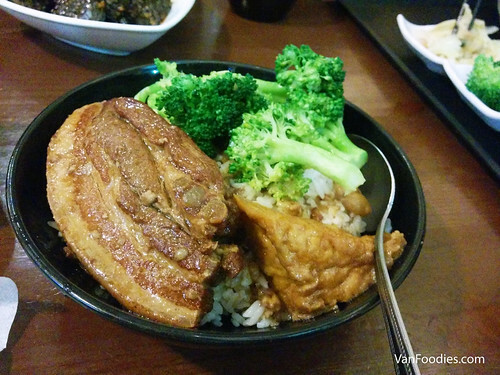 Lastly there was the Stewed Pork Belly on Rice 控肉飯. OH WOW! The melt-in-your-mouth pork belly was delicious. It was chopsticks tender, and the flavours were well-absorbed in this hunky cut of pork belly. The meat sauce was drizzled onto the rice too so it was flavourful. Not the most healthy dish, but definitely some hearty comfort food for a cold/rainy day. 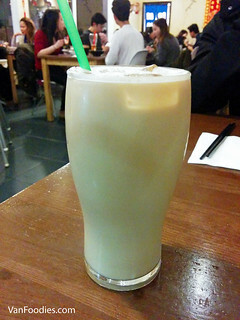 I also ordered the Old Memory Milk Tea 懷舊奶茶. LH described it like a Genmaicha but after taking a couple sips, I think I preferred the Chatime Roasted Milk Tea. The nutty flavour was rather subtle so it felt like the tea wasn’t steeped enough or the tea flavour was somehow diluted. It was still good, but Chatime was better in my opinion. The parking situation for Memory Corner is an issue. There were some street parking and a small parking lot right behind the restaurant. There are a number of eateries in the area, and residential buildings, so the demand for parking is quite high. It was a Saturday evening at around 7:30pm and we had to circle around the block 2-3 times before we luckily found a spot. Only because some customers left and freed up a spot. The lamb dish definitely stood out for us, and even after feeling full, I kept picking on the lamb slices because it was that good. Overall the dishes were very reasonably priced – the three dishes we ordered ranged from $6.25 to $9.25. Very affordable considering portion size. We actually had leftovers to take home. This is going on our list of go-to places to visit in Richmond.